I am thrilled to share this profile of Karen Rechnitzer, an IBCLC who works at a Washington, DC area hospital. While my work as a private practice practitioner affords me the opportunity to support moms and babies in the weeks and months following their return home from the hospital or birthing center, I believe that the care breastfeeding mothers receive in their first days is critical. I imagine that hospital work is incredibly challenging as well as rewarding and am glad, along with Lactation Matters, to welcome Karen to share her experience and wisdom with us. 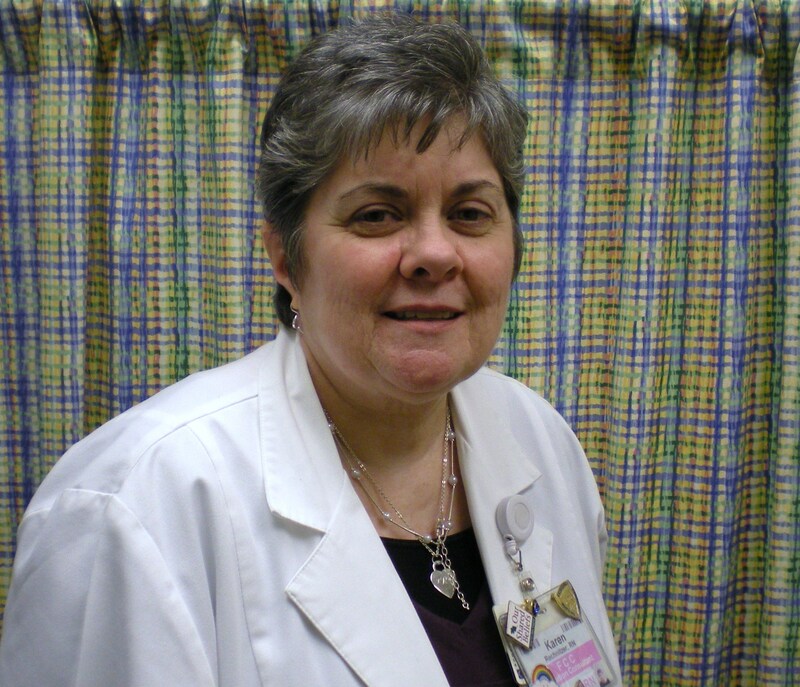 I have been a Registered Nurse for 38 years with a background in Medical-Surgical, Labor and Delivery, Home Health and as a Lactation Consultant. I worked in Labor and Delivery as an assistant head nurse when my first daughter was born. After my maternity leave, I was hoping to find a part time job. I applied for a job in the National Capital Lactation Center & Milk Bank at Georgetown University Hospital. Quickly, my job responsibilities expanded to include in-patient breastfeeding counseling. I became an IBCLC in 1985 and have continued to work with breastfeeding mothers and health care professionals in a variety of roles ever since, primarily in the hospital setting, but also with outpatient consults, private practice, home health and most recently, with an on-line employee education and support program. education, teaching breastfeeding classes, visiting and assisting mothers in Pediatrics, NICU, ICU, ER and other units with breastfeeding, participating in monthly Breastfeeding Committee meetings, and giving ongoing hospital staff education. One of my greatest challenges as a hospital based IBCLC is the short stay for mothers after birth. When I first started as an IBCLC, patient stays were longer. Mothers had many more opportunities to breastfeed with support and assistance prior to home discharge. The longer stay provided opportunities to work out breastfeeding problems. The plan of care could be modified daily and gradually evolve into a discharge plan. Increasing a mother’s success with latching and breastfeeding prior to discharge was often seen as a real confidence builder. Now many mothers are in hospital for only 2-3 days which translates into few opportunities for breastfeeding support. Patient education should be concise and tailored to the needs of each patient taking into account learning styles and readiness to learn. With shorter stays, it has to come together more quickly and that’s often challenging. I have a unique opportunity to teach and support families to breastfeed by meeting and working with new families from many different cultures and backgrounds. Each room visit provides me with a new situation that encompasses a specific blend of personal and medical history that will shape that encounter. Many of the experiences are “routine” and many are challenging. discussion and creative problem solving. I am fortunate to work on a daily basis with other health care professionals as a team to provide each patient and their family with the best possible care. I would encourage all IBCLCs to embrace education in order to broaden their knowledge in regards to women’s health. Understanding each woman’s health history is crucial to providing excellent lactation support. The patient’s past medical and social history as well as their previous and present pregnancy, delivery, postpartum and breastfeeding experiences will inform and possibly determine their present breastfeeding success. In the healthcare field, as with most professions, learning is ongoing. Practices and delivery of care are in constant motion. Staying up to date is crucial to your success. Join national and international organizations such as ILCA. Participate in local organizations and groups that support networking, continuing education, sharing of ideas and mentoring with other Lactation Consultants and health care professionals. I am interested in your on-line employee education and support program. Is this something that you have devised yourself and/or is it available to others?